The expansion of the missionary movement into Africa was part of the growing conception of Christian responsibility for the regeneration of African peoples. The anti-slavery issue and the humanitarian conscience also played a vital role in stimulating European interest in Africa and gave an impetus to mission work. It included the opening up of Africa to forces of change namely commerce (“legitimate commerce”, i.e. non-slave trade), Christianity, Civilization and Colonization. The others included the Christian responsibility for the regeneration of African peoples. The achievement of the purpose of these Christian Missions came with some costs. Several missionaries died at a youthful age due to the unfriendly tropical climate. Again, in West-Africa, the efforts to go beyond the coast to reach those inland with the gospel coincided with the southwards expansion of Islam which posed some threat to the expansion of the work of Christian evangelizing missions. The work of the missionaries also had little success initially. The people received the message with indifference. It was however in the coastal territories filled with mulattos and other European trading communities that Christianity won some of its early success. The first Europeans arrived at the West-African Coasts at the end of the fifteenth century. For several years they paid attention to slave trade rather than evangelization and Christianization of the people of West-Africa. However, by the turn of the Nineteenth Century there was systematic efforts by churches of Christian Europe, namely: Anglicans, Methodists, and Baptists who were active in Sierra Leone and, with Presbyterians, in Nigeria, while Methodists also set up missions in Ghana, Gambia, and Dahomey. In the 19thh century, too, Afro-Brazilians returned to Benin and Nigeria with Catholicism. A new era began with the settlements of Black Christians from Nova Scotia in Sierra Leone in 1787 and the missionary advance inland from Cape Town beginning with the arrival there of J. T. van der Kemp in 1799. New missionary societies (the LMS, the CMS, the Holy Ghost Fathers, the White Fathers, etc.) began work in many parts of Africa. The CMS began to work in the freed slave villages in Sierra Leone in 1804 and the Methodist in 1811. The early success of the missionaries included areas like Freetown and surrounding villages. Some early success included the Liberian coast where Afro-Americans and freed slaves were converted. The others include the French trading posts at Grand Bassam (Ivory Coast), Assinie and Libreville in Gabon. Apart from the extreme south and the Horn, the interior was hardly touched by Europeans before the last quarter of the Nineteenth Century. At the end of the eighteenth century, the Evangelical Revival began to bring to Africa an influx of missionaries whose laoburs would produce the first fruits of an enduring Christian presence in Sub-Sahara Africa. In the later 19th century, the immense African interior remained the principal object of the Catholic Priests, and from 1867 until his death in November 1892 Cardinal Lavigerie planned the planting of churches in Africa South of the Sahara. It is important to emphasize that the modern history of the Christian Mission in Africa started from the late Eighteenth Century, the Catholics had been there earlier in the first centuries of the Christian era especially during the first Portuguese adventures. Therefore the period for the rise of Christianizing Missions in the late Nineteenth Century has been considered as reprise. The late Eighteenth Century witnessed the rise of Christian groups in Europe that resorted to the evangelization of Africa. For instance, on 2nd October 1792, the Baptist Missionary Society was formed followed by the interdenominational London Missionary Society which was established in 1795. The others include the British and Foreign Bible Society in 1804, which was tasked with the responsibility of promoting the translation and printing of the Holy Bible. Initially, a majority of the missionary journeys was done with English-Speaking Protestants and later, in the 1820s and 1830s, they were joined by continental Protestantism from Germany, Switzerland and France. There were related organizations that sprang up in Scandinavia, Holland and the USA. West Africa owes to the Christian missionaries not only a new religious faith which has changed the beliefs and life of millions of people, but also the foundation of western education. The Portuguese were the first to introduce the Christian faith into West Africa but following their departure from the West Coast in the mid-seventeenth century, the Christian religion survived only in Upper Guinea where a bishop was maintained in the Cape Verde Islands serving also a part of the mainland. It was not until the nineteenth century, that the new religion was really established in West Africa. In this chapter, we shall examine how Christianity and Western-style education influenced West Africans values, attitudes and life-styles. As a predominantly Roman Catholic country, France encouraged Roman Catholic missionaries’ right from the start of her colonial activities in West Africa. The Church had its strongest hold in the Senegambia area. Unlike the Portuguese, the French colonial officials encouraged the Christian missionaries in the promotion of formal education and social services, notably health. In the field of education, however, the missionaries had to adjust their programmes to fit in with the policy of assimilation. From the second half of the eighteenth century, a fervent wave of evangelical spirit developed in the United Kingdom, Europe and the New World which inspired men and women with the missionary fervour to found religious societies whose members would go out to Africa and the other lands. They were to spread the message of the Gospel, render social services to the people and to assist in the suppression of slavery and the slave trade. These new movements considered such ventures to be their contribution to Europe’s reparation for centuries of exploitation of Africans, reparation for the centuries of exploitation which the Trans Atlantic slave trade had caused to African society. Among the early Protestant evangelical societies founded in Great Britain were the Baptist Missionary Society, the Church Missionary Society for the Propagation of the Gospel, the Wesleyan Missionary Society and what became known as the Presbyterian Missionary Society of the Church of Scotland. Similar organizations were formed in several other European countries. These included the Basel Missionary Society, founded in Switzerland, and the Breman Mission formed in Germany. The evangelical societies founded in the Americas included the Baptist Missionary Board and the Nova Scotian Methodists, whose members went to work among the Maroons, who had settled mainly in Liberia. While the protestant evangelical movements were gaining ground in West Africa, similar movements were being promoted by the Roman Catholic Church in Europe. With the support of the Propagation of the Faith within the Vatican, whose Cardinal Secretary became Pope Gregory XVI, various Roman Catholic missionary societies were founded. Among these were the Congregation of the Holy Ghost (commonly known as the Holy Ghost Father), the Society of African Missions (SMA), the Society of Missionaries of Africa, popularly known as the White Fathers because of the white Muslim-like clothing which the Fathers wore, and the society of the Divine Word (SVD, abbreviated from its Latin name). These missionary societies laid the foundations of the Roman Catholic Church in West Africa, which lasted through to the independence period when African clergy replaced the white pastors. The vast majority of the people of The Gambia are Moslems; but a sizeable percentage of the population, especially in and around the capital Banjul, are Christians. Early missions conducted by Roman Catholics were short-lived. A new attempt to spread Christianity was made when the Church Missionary Society (CMS) arrived from Britain in 1821. They were followed in turn by the Methodists and the Roman Catholics. Within a short time the missionaries spread their activities inland. Barely ten years later, after the first missionaries arrived, the Methodists, for example, had started a station as far inland as MacCarthy Island. As happened in other territories, the Christian missionaries did not confine their work to the spread of the gospel alone. Besides education, they cared for the sick. Thus, as early as 1823, the Roman Catholic sisters started a clinic for the sick and for children in Banjul. After earlier unsuccessful attempts by the missionaries Chretien Proten, Henrick Huckuff and Jacobus Capitein, the Anglican, Rev. Thomas Thompson, arrived in Cape Coast in 1752. Among his pioneering achievements, he arranged for three youths to be sent to England for training as evangelists. One of them, Philip Quaque, returned in 1765 as an ordained priest. He worked zealously as an evangelist and schoolmaster in the Castle School until his death in 1816. His work, however, did not extend much beyond Cape Coast and the neighbouring area. Renewed evangelisation started when the Basel (later known as Presbyterian) missionaries started work at Osu (Accra). Soon after, in 1835 they moved up to Akropon on the hills in Akuapem, where the pioneer missionary the Rev. Andreas Riis, assisted by a team of West Indian evangelists, laid the foundations of the Basel Missionary Church in the country. In the same year as the Basel missionaries settled in Akuapem 1835 the Wesleyan (later Methodist) Church was established at Cape Coast by the Rev. Joseph Dunwell. He was followed, three years afterwards, by the Rev. Thomas Birch Freeman, son of a London-based West Indian father and an English mother. He introduced the Methodist Church in Asante in 1839, and won the support of the Asante king. In 1880, two Roman Catholic priests of the Society of African Missions (S.M.A. ), Father Auguste Moreau and Father Eugene Murat, arrived at Elmina and revived the Roman Catholic Church in Ghana. The American Episcopal Evangelical (A.M.E.) Zion Church owes its foundation in Ghana to Bishop J. Bryan Small, who started work first at Keta in 1898. In the days of Portuguese contacts with Nigeria, Catholic priests had established missionary stations in Benin and the neighbourhood. But despite the work of Portuguese missionaries based on the island of Sao Tome and later of Spanish missionaries in Benin, it was not until the nineteenth century that the Christian religion was firmly established in Nigeria. It started first among the Yoruba recaptives who had embraced the Christian faith while in Sierra Leone (freed from slave trading ships by the British Royal Naval Squadron), and who returned home between 1839 and 1845. The pastors of the Church Missionary Society, from Badagry and later from Sierra Leone, visited these Christian communities in Abeokuta and other towns. Among the first missionaries was the Rev. 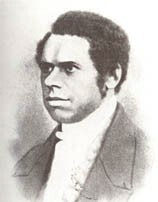 Henry Townsend who went from Sierra Leone to Badagry in 1842 in his company was the Rev Ajayi Crowther. Success followed the efforts of the pioneer missionaries. C.M.S. churches were firmly established in several important towns, such as Abeokuta (1846), Lagos (1851), Ibadan (1853), and Oyo (1856). Next, branches of the C.M.S. church were founded in south-eastern Nigeria, the chief centres being Bonny and Brass. The effects of work done by Bishop Ajayi Crowther, assisted by the Igbo recaptive the Rev. J. C. Taylor, in these parts of southern Nigeria can still be seen today. Other missionaries opened mission stations in the country. These included the Baptist missionaries who under the American evangelist, Thomas Bowen, started work from Ogbomosho in 1855. About the same time, the Church of Scotland (Presbyterian) headed by the Rev. Hope Waddell started pioneering work, in 1846, in Calabar. Hope Waddell was later joined by the Rev. Hugh Goldie and William Anderson. Another missionary whose memory is revered in Nigeria was Mary Slessor, she arrived in the country in 1876, and for many years worked assiduously as a missionary nurse. She succeeded in stopping the killing of twins in the areas where she served. The story of the planting of Christianity in Nigeria would be incomplete without a mention of the Italian Roman Catholic priest, Father Berghero. Operating from Whydah in what is today the People’s Republic of Benin (formerly Dahomey), Father Berghero, in 1860, visited Abeokuta and Lagos where freed Catholic slaves from Brazil welcomed him warmly. A permanent station was established in Lagos in 1868, soon followed by others at Lokoja, Abeokuta and Ibadan. Within ten years of Father Berghero’s visit, the Roman Catholic Church in Nigeria had become so well established that it ceased to be under administration from Dahomey. By 1885, the church had spread further inland, thanks to Father Joseph Lutz who started work around Onitsha in 1886 and spread the gospel in many parts of the present day Imo and Anambra States. Another important Catholic missionary in this area was the Irishman, Bishop Shanahan. Although Lokoja had a small C.M.S. station in 1858, it was not until 1889 that the missionaries entered Hausaland, which was predominantly Muslim. Their converts, for many years, were confined to the people of southern Nigerian extraction resident in the north, and to the-large non-Muslim population of the north. In Sierra Leone, the Church Missionary Society (CMS), offshoot of the Anglican Church, was the first to become firmly established chiefly among the freed – captive and freed – slave settlers from Britain, Nova Scotia and other parts of the New World. They were followed by other major missionary bodies, including the Methodists and the Roman Catholics. As they could not recruit British missionary volunteers initially, the Church Missionary Society sponsored the services of German missionaries, who were Lutherans, to come out to Sierra Leone. The first batch, who came out between 1804 and 1806, included pioneer missionaries like Renner and Nylander. Another important German missionary was Wilhelm Johannson, better known by the English version of his name, William Johnson, who is revered in the history of the CMS in West Africa. The Methodists, known as the Wesleyan Missionaries (after their founder), arrived in Freetown in 1811. Their converts increased steadily in numbers until 1821 when a section broke away to form the first independent African, Christian church in West Africa, called the West Africa Methodist Church. In spite of the division, the parent Methodist missionary church played an important role in the history of Christianity in Sierra Leone. The next major Christian missionaries to go out to Sierra Leone were the Roman Catholics. After an unsuccessful beginning by the society of African Missions (SMA), this missionary body moved into other territories in what is now Liberia, Ghana and Nigeria. They were replaced in Sierra Leone by the Holy Ghost Fathers in 1864, who made converts in large numbers not only among the ‘pagans’ but also among the members of the then competing Christian churches. Like the Methodists, the Roman Catholic missionaries spread the faith notably in the interior, which later became Protectorate. The impact of Christianity on West African society has persisted to this day. While it has brought undoubted benefits, it has also harmed the traditional way of life. The blessings which Christianity has brought to West Africa are many. Apart from giving to the converts a new religious faith which they consider is superior to the traditional religions, the Christian missionaries did pioneering work in introducing new crafts, industries, Western education and modern health services. The Christian religion teaches the doctrine of one supreme God and is opposed to the worship of any other forms of deity. Its message was that of love and the universal brotherhood of mankind. In this respect the Christian religion therefore differed from the traditional religions of West Africa, which along with an acceptance of one Supreme Being worshipped a hierarchy of gods. Some of the traditional religious beliefs advocated certain practices such as human sacrifice and the killing of twins whose birth was regarded as an evil omen. Christianity stood firm against such evil practices. Without denying that prior to the introduction of Christianity in West Africa the people had developed their own crafts, one must admit that it was Christian missionaries who introduced modern forms of crafts such as carpentry and masonry. The early missionaries set up craft centres as part of their educational programmes. Also the missionaries set up model farms where scientific agriculture was taught and new crops were introduced for the people, to go alongside longstanding indigenous production. A notable example, in Ghana, was the Methodist experimental farm near Cape Coast whose crops included cotton, coffee, black pepper, mango, ginger, cinnamon and olive trees. Another valuable contribution of the Christian missionaries in West Africa was the development of literature in the local vernaculars, this included the translation of the Bible into some of the important local languages. In Ghana the Presbyterians were pioneers in reducing Ga and Twi into writing. In 1858 the Rev. Johannes Zimmermann wrote a grammar of the Ga language, and in 1874 the Rev. J. G. Christaller produced a Twi Grammar and Dictionary. In Fanteland, the Methodists and Roman Catholics pioneered similar works. While the Evangelical Presbyterian missionaries were the First to develop literature in Ewe, the Roman Catholics were responsible for Nzima literature. In Nigeria, one of the lasting works of the C.M.S missionaries was the development of literature in Yoruba. 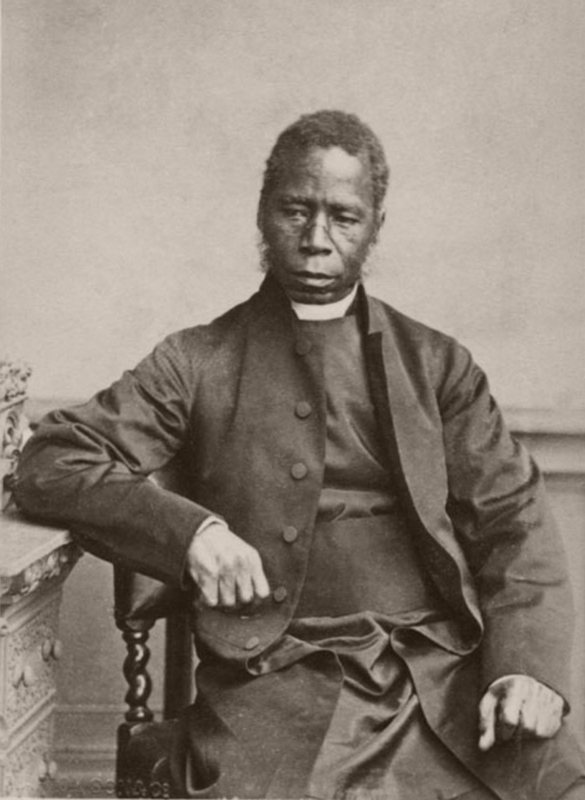 Among several others, the native Bishop Ajayi Crowther produced the first translation of the Bible in Yoruba. In 1859, the first newspaper in Yoruba, called the Iwe-Irohim, was published by the missionaries. Similar developments were carried out by the missionaries in other Nigerian languages, Efik, Kanuri, Igbo, etc. In the Gambia, the Methodist missionary and first principal of what later became known as the Gambia High School, the Rev. James Fieldhouse, produced a Wolof Grammar in 1876. The missionaries also greatly improved the health services. Prior to advent of the Christian missionaries and indeed well into the pre-independence period, most sick people depended for cure upon concoction herbs and roots and barks of trees. Although modern scientific research has confirmed the medicinal properties of these concoctions, traditional medical practice had several shortcomings. Preventive medicine was hardly known; the result was that epidemics of different kinds were frequent. Also, the traditional doctors more often than not could not diagnose illness accurately. They often attributed natural ailments to supernatural causes and resorted to mystic cults to appease the ‘unknown’ spirit, before applying medicine to the sick person. They also prescribed many taboos which, in the light of modern medical science, had no relation whatever with the illness being treated. However, the early missionaries established medical centres, at first at their mission posts, and later far and wide, to attend to the sick. In due course leprosariums and orphanages were built to supplement their medical services. For instance, in Nigeria, one of the first groups of missionaries to introduce organised medical services were the Roman Catholics. Father Jean Marie Coquard, operating in and from Abeokuta for forty years, was renowned among the Egba as a priest and surgeon in the second half of the nineteenth century. In 1892, the Church Missionary Society opened the Iyi Enu Hospital in Onitsha which is today a leading hospital in Anambra state. In 1902 the Methodists opened a clinic at Igbo-Ora. Meanwhile, the Scottish missionary, Mary Slessor, had established a reputation in the Cross River area as a nurse. Through hard work and persuasion she succeeded in stopping the practice among the people of killing twins. Another important missionary doctor was J. R. Stephen who for many years headed a missionary hospital at Ilesha. As happened in other West African countries, many more mission-sponsored hospitals were founded in the course of the twentieth century. Also, Christian missionaries in Ghana were as zealous as their counterparts in Nigeria in pioneering medical services. The Roman Catholic Sisters provided medical care in the Upper and Northern Regions of the country before the government started to provide hospitals and clinics in the regional and district headquarters. In the Western Region, the Catholic Sisters running a hospital at Eikwe specialized in maternity cases, and like Slessor in Nigeria succeeded in stamping out the practice of killing twins at birth. Other Roman Catholic hospitals were built in all the nine regions of the country; including those at Asikuma and Foso (Central Region), Akyem Swedru (Eastern Region), Berekum (BrongAhafo), Maase (Asante Region) and Anfoega (Volta Region). The Presbyterians, also, opened hospitals in several parts of the country, including the one at Agogo in Asante-Akyem. Among other missionary hospitals of long standing and reputation are those run by the Methodists at Wenkyi in the Brong-Ahafo Region, and by the Seventh Day Adventists at Kwahu Atibie in the Eastern Region. Christian missions also took a leading role in the campaign to end the slave trade and to suppress slavery. Perhaps the greatest service of the missionaries was the promotion of western education and the development of vernacular literature. Until almost the end of the colonial period education was still largely in the hands of the churches. It was only after the Second World War that the colonial governments started to show a real interest in the promotion of formal education in West Africa. In Sierra Leone, among the earliest higher institutions which the C.M.S. opened was the Christian Institute, established in 1814 for the training of teachers, catechists and priests. In 1827 it grew into Fourah Bay College. In 1876 the college became associated with Durham University in England, which awarded degrees to students of the college. This special relationship continued until 1960 when Fourah Bay became a college of the newly reconstituted University of Sierra Leone; the other constituent college located at Njala developed from a training college founded in 1920. In 1845 the C.M.S. opened, in Freetown, the first boys’ secondary school in the country and another for girls in 1849, later renamed the Annie Walsh Memorial School. The Methodists founded the Boys’ High School in 1874, and another high school for girls six years later. The lead was followed by other missionaries, notably the Roman Catholic, whose first higher institution was St Edward’s Secondary School in Freetown. Secondary Schools in the Protectorate started later, following the establishment of Bo Government Secondary School in 1906. In 1950 Albert Academy was founded in Freetown; for-a long lime it was the secondary school in the Colony serving largely children from the provinces, among them were the future heads of state, Sir Milton Margai and Dr. Siaka Stevens. As happened in other colonial territories, the government did not show great interest in the provision of education in Ghana until the missionaries had extended their services throughout the country and had set up primary schools and a few secondary schools and training colleges. Up to Guggisberg’s time, the church schools did not receive grants from the government. Public money was spent only on the small number of government schools, totaling nineteen when Governor Guggisberg assumed office in 1919. In 1925 the Governor introduced measures which helped the efforts of the missionaries. Among other things the regulations required that all teachers should be registered, and a minimum salary was fixed. The government gave grants according to the strength of the staff and the efficiency of the school judged by inspection reports and the results of public examinations. Teacher training colleges in Ghana did not expand as fast as the secondary schools. Nevertheless, the first higher institution in Ghana, now the Presbyterian Training College at Akuapem Akropon, was established in 1848, first as a centre for training catechists, and later to train teachers as well as ministers of the Presbyterian Church. In 1858 ten years after the founding of the first college, the Presbyterians opened a sister college at Aburi for the training of women teachers. It was not until 1909 that the government opened a teacher training college and a technical school in Accra. The training college later became part of Achimota College. Two other training colleges opened by the missionaries, in the early days, were the Wesley College in Kumasi (1922) and the Roman Catholic Training College at Amisano, near Elmina (1931) which in 1936 moved to the campus of the newly founded secondary school, St Augustine’s College at Cape Coast. The first school in Nigeria was started by the Methodist missionaries at Badagry in 1842. This was the work of the great missionary, Thomas Birch Freeman, who placed two missionaries, Mr and Mrs. de Graft, in charge of the school. Soon after the Methodist experiment, the church Missionary Society set up their own school at Badagry. These pioneer mission schools met with a discouraging response. They were closed down in 1852 in favour of schools opened in Lagos which, in 1851, had one time British control. Earlier in 1846, the Rev. Hope Waddell of the Church of Scotland had opened a school at Duke Town, Calabar. Within ten years the C.M.S had opened twelve more schools in what is today Cross Rivers State. By the close of the nineteenth century the major Christian missionary churches had opened elementary schools in many part of southern Nigeria with an enrolment of about 74,000 by the First World War. Soon after the start of elementary schools, the missionaries started opening higher institutions also. Important among these, all in Lagos, were the Baptist Academy in 1855, the C.M.S. Grammar School for Boys in 1859, St Gregory’s College opened by the Catholics in 1876, Methodist Boys High School 1878 and Methodist Girls’ High School 1879. Soon after secondary schools were opened in other parts of southern Nigeria, including Bonny High School, which was taken over by government in 1904. To supplement these missionary efforts in the field of higher education, the government opened its own secondary school in Lagos in 1909, this was King’s College. Following agitation by the people in 1934, the government opened the old Yaba Higher College and Medical School, which awarded diplomas acceptable only locally. This instruction in 1948 developed into the University College in Ibadan. The original Yaba College in Lagos has grown into a polytechnic. Predominantly Muslim territory, the North received western education later than the South. By 1914 there were barely thirty schools in that vast area. As happened in Ghana, the development of training colleges in Nigeria was slower than secondary schools, though the C. M. S. had opened the first training college at Abeokuta as far back as 1849. In the Gambia, as happened in other territories, the Christian missionaries did not confine their work to the spread of the Gospel alone. Besides education, they cared for the sick. Thus as early as 1823, the Roman Catholic Sisters started a clinic for the sick and for children in Banjul. The churches opened primary schools both in the capital and in the rural communities. Their greatest legacy in the field of education was the foundation which the Methodist laid for what is today the Gambia High school. The early European Christian missionaries in West Africa experienced a number of difficulties, some arising from factors outside their control and others of their own making. The tropical climatic condition in the country was not favourable to the early missionaries who came to the shores of West Africa. The high temperatures coupled with high rainfall patterns in some parts of the country experienced during the daytime, made the missionaries stay indoors, which slowed down their activities. Other difficulties they faced were the problems of the many languages and dialects and their ignorance of the true meaning of the various cultures, beliefs, values and ways of life of the people whom they set out to convert to Christianity. For the West Africans, the acceptance of Christianity meant the total rejection of most of the cherished institutions upon which their society rested. The problems created by the white missionaries themselves arose largely from a misconception of what Africa represented. Europe in those days looked upon Africa as ‘the Dark Continent’ with very primitive civilizations, and most Europeans refused to adapt their religion to suit the local situation. And yet this was what earlier missionaries in pagan Europe had done when, for example, they had changed the Sabbath to suit the pagan Sun Day (hence Sunday), and had also adopted the dates of the pagan festivals to celebrate Christmas Day and the Easter festival. The early African converts to Christianity, were made to abandon their ancestral culture and way of life as ‘pagan’ therefore to be shunned. Indeed, in some situations the converts were taught to feel that they were absolved from obeying their own traditional rulers and certain laws of the state. These trends occasionally brought kings into conflict with the missionaries and their converts. The greatest problem faced by the early European Christian missionaries was, the tropical climate and health Hazards. Many missionaries died because of the climate and tropical disease. This single problem made the missionary work very difficult. However, the discovery of quinine and other curative medicines in the late 19th century made the history of the missionary work in West Africa a different thing altogether. Almost all the missions in West Africa faced financial problems in the early stages of their missionary work. They relied very much on their home churches for their funds. But the funds and other needed materials even when available could not reach their station in time. This was because all the ships that came to the coast at that time were owned by trading firms and companies whose interest were basically on trade. In such asituation, provisions and other things had to be sent into the country not in large quantities as would have been desired by the missionaries. Other difficulties the early Christians faced were the problems of the many languages and dialects and their ignorance of the true meaning of the various cultures, beliefs, values and ways of life of the people whom they set out to convert to Christianity. It was difficult for the European missionaries to communicate freely with the local people. They had to speak through few interpreters who did not have sufficient education to interpret correctly. In such situations, the message sometimes appealed to the local people depending on the efficiency of the interpreter. Moreover, speaking through interpreters is a defective means of communicating one’s thoughts to one’s audience. Lack of transport from the coast to the interior parts of West Africa was one of the major difficulties encountered by the missionaries. There were only bush paths, and no roads in the early times. Their luggage and other necessities had to be carried on heads and took a long time before reaching the missionaries. Besides, the missionaries had to travel longer distances to inland towns from their southern stations. Another difficulty that the early missionaries faced in the spread of Christianity was insufficient Christian literature at that time. There were no Bibles in local languages, likewise grammar books were scant, so the missionaries had to spend time learning local languages, and translated the Bible and wrote series of grammar books. For instance, in Ghana, it was in 1858 that Rev. Johannes Zimmermann wrote a grammar of the Ga language and translated the entire Bible and a Bible history into Ga. Then in 1874, the Rev. John G. Christaller (described as the “Father of Twi Literature”) produced a Twi grammar and dictionary, a collection of Twi proverbs, a Twi translation of the Bible as well as prayers and hymns. In Nigeria, one of the lasting works of the C.M.S. missionaries was the development of literature in Yoruba. Among several others, the native Bishop Ajayi Crowther produced the first translation of the Bible in Yoruba. In 1859, the first newspaper in Yoruba. Called the Iwe-Irohim, was published by the missionaries. Similar developments were carried out by the missionaries in other Nigerian languages, Efik, Kanuri, Igbo, etc. Lastly, the missionaries were not used to eating our local foods. This made it difficult for the early missionaries to stay in the country for long. However, with time, they brought some crops, which they cultivated and which sustained them. As an institution introduced by agents with radically different values, the Christian religion damaged the culture and traditional beliefs of the people of West Africa. Instead of adapting the teachings and practices of the ‘new’ religion to suit indigenous values, as it did when the same Christian religion adopted Greek, Roman, German and Anglo-Saxon native practices, the early Christian missionaries condemned totally as ‘pagan’, and to be avoided by their converts, whatever they considered strange. Being ignorant of the significance of certain institutions and practices of the people of West Africa, and occasionally being misled by their over-zealous followings into wrongly interpreting the people’s heritage, the missionaries compelled pupils in their schools and docile adult converts to shun their own ancestral practices. A notable example was the Asafo Company, a purely military and social organisation of the peoples of Ghana, which was condemned by the early missionaries because of its presumed connection with fetish practices. And yet the Asafo provided most of the services which a community needed: protection against military attacks, communal services, etc. Christian converts were indoctrinated to frown upon the use of indigenous first names in favour of ‘Christian’ ones. Often drumming and the harmless songs and dances of the people were condemned. The education provided in schools in early days also tended to place great emphasis on the superiority of western culture. Textbooks were heavily biased towards western ideas and values. History books tended to exaggerate in achievements of Europeans, making no reference to African’s own great past. Groundless fears that the converts would become contaminated with ‘paganism’ led some of the Christian missionaries, notably the Presbyterians, to separate the Christians from the rest of the township. As happened in parts of Yorubaland in the last century, some of the Christian missionaries often engaged in local politics and took an active part in helping the colonial authorities in their wars of territorial expansion. In conclusion, the converts tended to look down upon many things in their ancestral culture. It would be wrong, however, to blame all these ills on the Christian missionaries alone. Some progressive Europeans, like the first principal of Achimota College, Rev. A.G. Frazer, did much to encourage the promotion of indigenous culture, but by and large the colonial authorities contributed to dwindling a good deal of our cultural heritage. Kalu, Ogbu. The History of Christianity in West Africa. Longman Publishing Group, 1980. Hildebrandt, Jonathan. History of the church in Africa: a survey. Africa Christian Press, 1996. Kalu, Ogbu. Christianity in West Africa: The Nigerian Story. Daystar Press, 1978. Babalola, E. O. Christianity in West Africa. Bamgboye & Company Press, 1976. Isichei, Elizabeth. A history of Christianity in Africa: From antiquity to the present. Wm. B. Eerdmans Publishing, 1995. Hilliard, F.H., 1957. A short history of education in British West Africa. T. Nelson. Ekechi, Felix K. “Colonialism and Christianity in West Africa: The Igbo Case, 1900–1915.” The Journal of African History 12, no. 1 (1971): 103-115. Lewis, Donald M., ed. Christianity reborn: the global expansion of evangelicalism in the twentieth century. Wm. B. Eerdmans Publishing, 2004. Debrunner, Hans Werner. A history of Christianity in Ghana. Waterville Pub. House, 1967. Shaw, Mark. The kingdom of God in Africa: A short history of African Christianity. Baker Pub Group, 1996. Hastings, Adrian. A history of African Christianity 1950-1975. Vol. 26. CUP Archive, 1979. Crampton, Edmund Patrick Thurman. Christianity in northern Nigeria. Burns & Oates, 1979. Porter, Andrew. “Church history, history of Christianity, religious history: some reflections on British missionary enterprise since the late eighteenth century.” Church History 71, no. 3 (2002): 555-584. Etherington, Norman. “Missionaries and the intellectual history of Africa: a historical survey.” Itinerario 7, no. 2 (1983): 116-143. Clarke, Peter Bernard. West Africa and Christianity. Arnold, 1986.